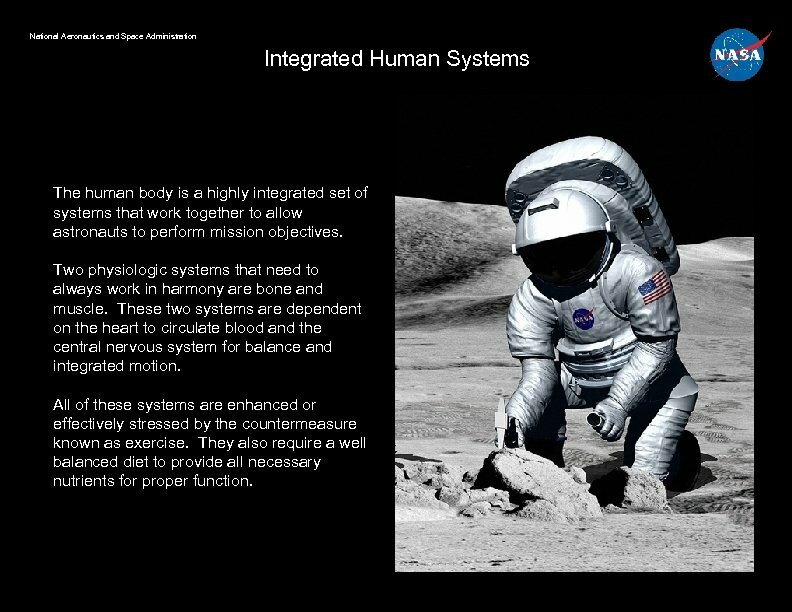 National Aeronautics and Space Administration Integrated Human Systems The human body is a highly integrated set of systems that work together to allow astronauts to perform mission objectives. 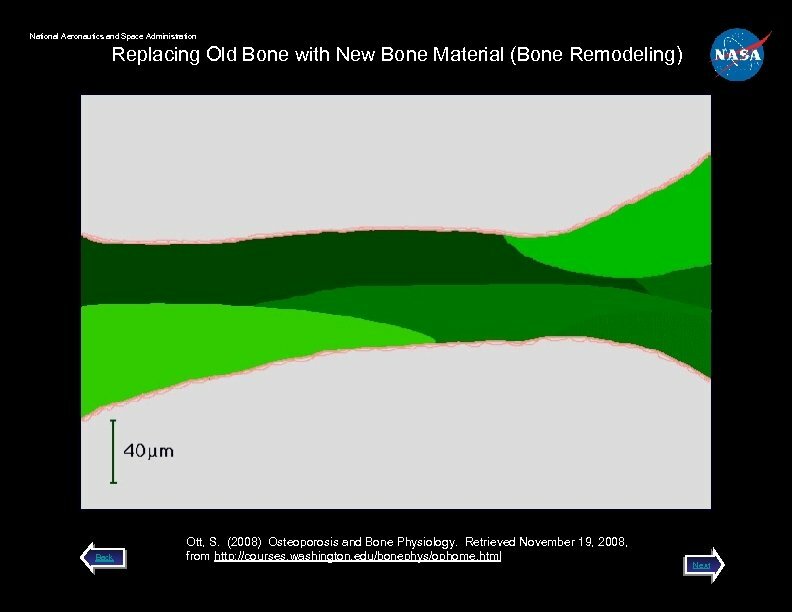 Two physiologic systems that need to always work in harmony are bone and muscle. These two systems are dependent on the heart to circulate blood and the central nervous system for balance and integrated motion. All of these systems are enhanced or effectively stressed by the countermeasure known as exercise. They also require a well balanced diet to provide all necessary nutrients for proper function. 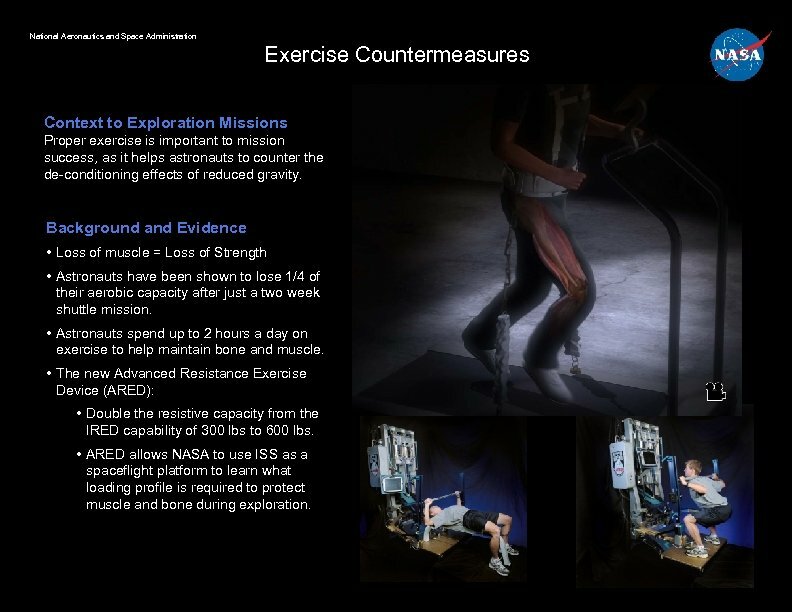 National Aeronautics and Space Administration Exercise Countermeasures Context to Exploration Missions Proper exercise is important to mission success, as it helps astronauts to counter the de-conditioning effects of reduced gravity. 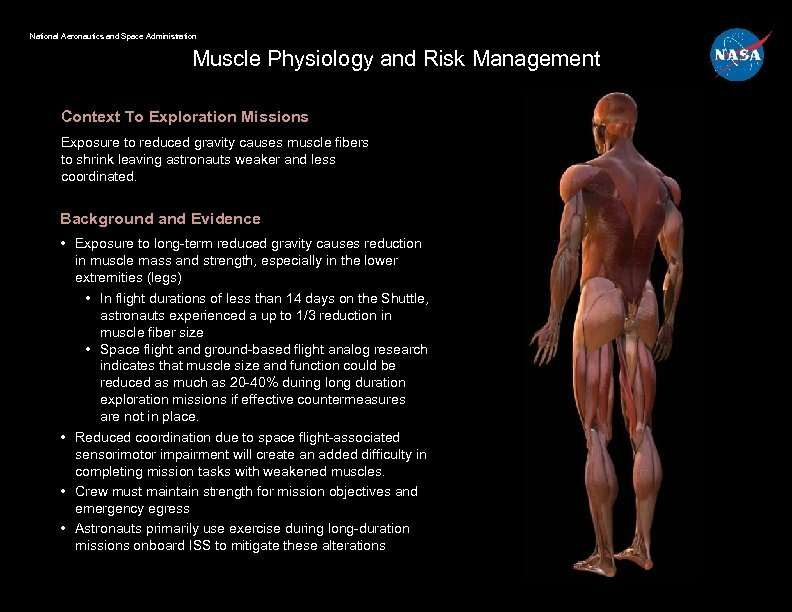 Background and Evidence • Loss of muscle = Loss of Strength • Astronauts have been shown to lose 1/4 of their aerobic capacity after just a two week shuttle mission. 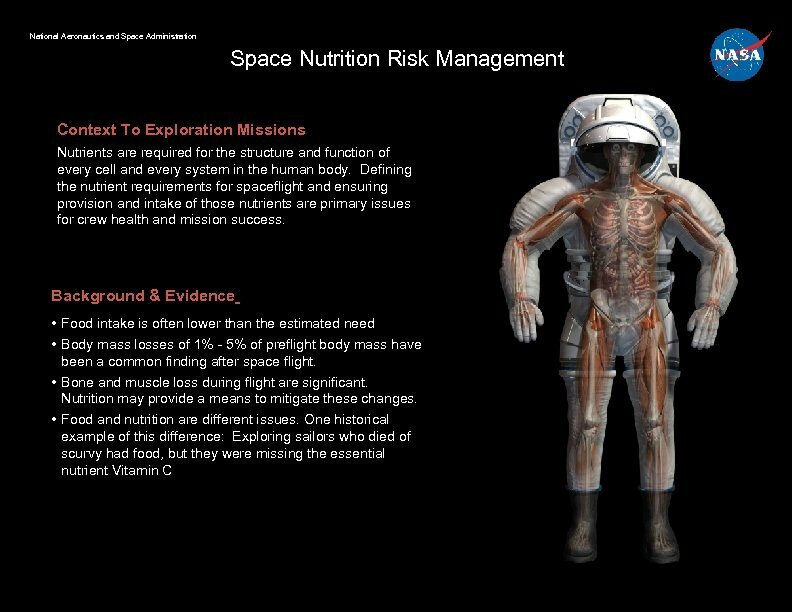 • Astronauts spend up to 2 hours a day on exercise to help maintain bone and muscle. • The new Advanced Resistance Exercise Device (ARED): • Double the resistive capacity from the IRED capability of 300 lbs to 600 lbs. 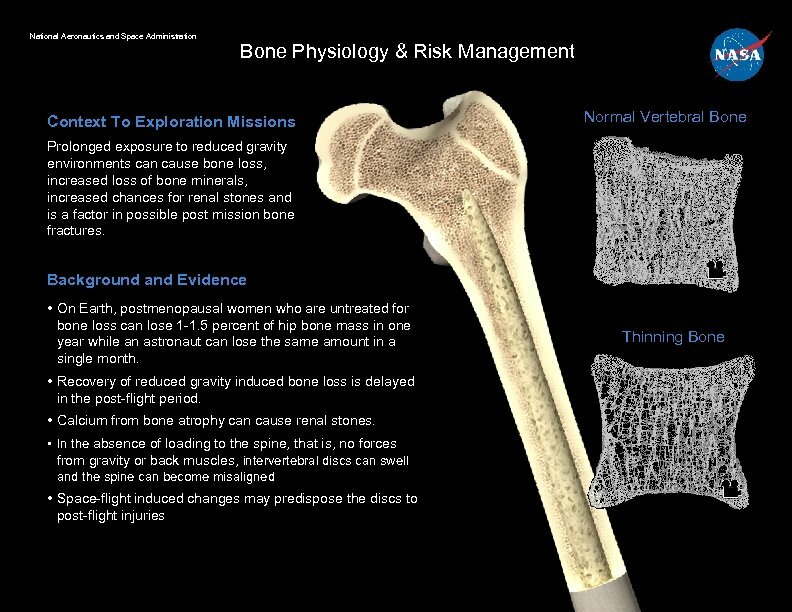 • ARED allows NASA to use ISS as a spaceflight platform to learn what loading profile is required to protect muscle and bone during exploration. 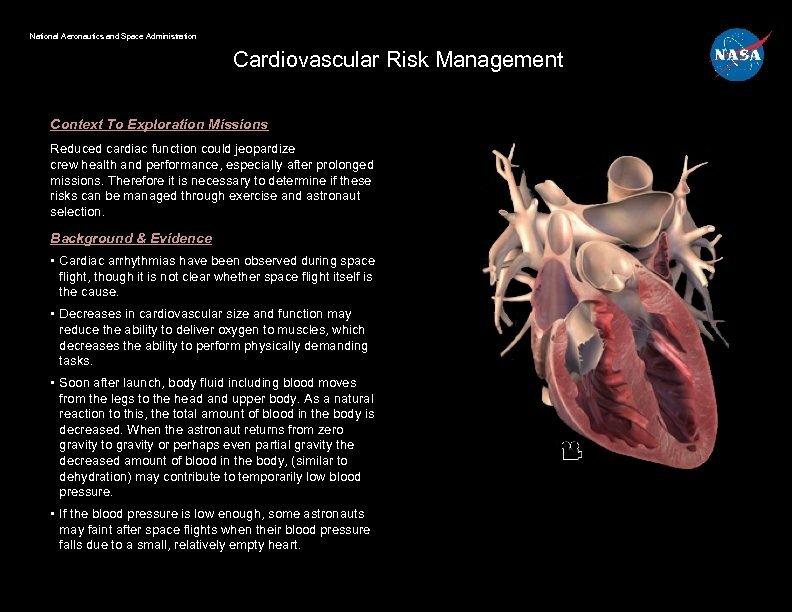 National Aeronautics and Space Administration Cardiovascular Risk Management Context To Exploration Missions Reduced cardiac function could jeopardize crew health and performance, especially after prolonged missions. 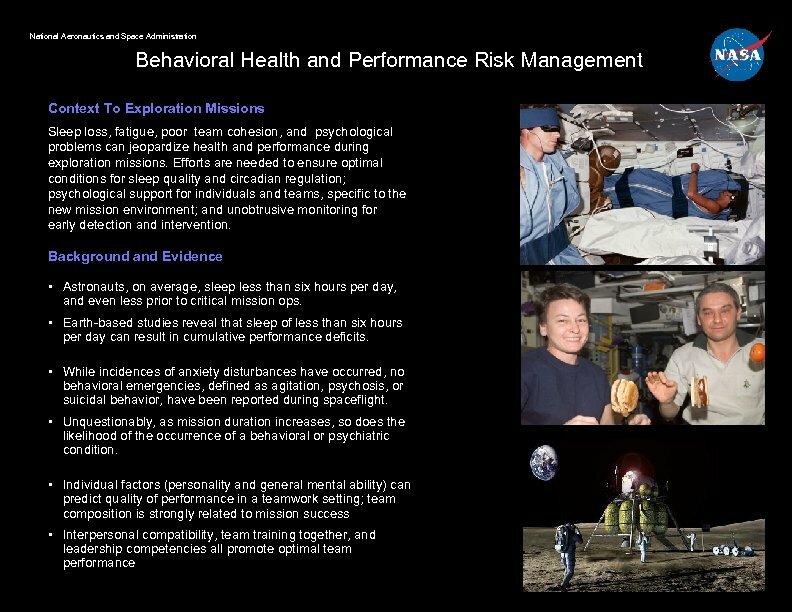 Therefore it is necessary to determine if these risks can be managed through exercise and astronaut selection. 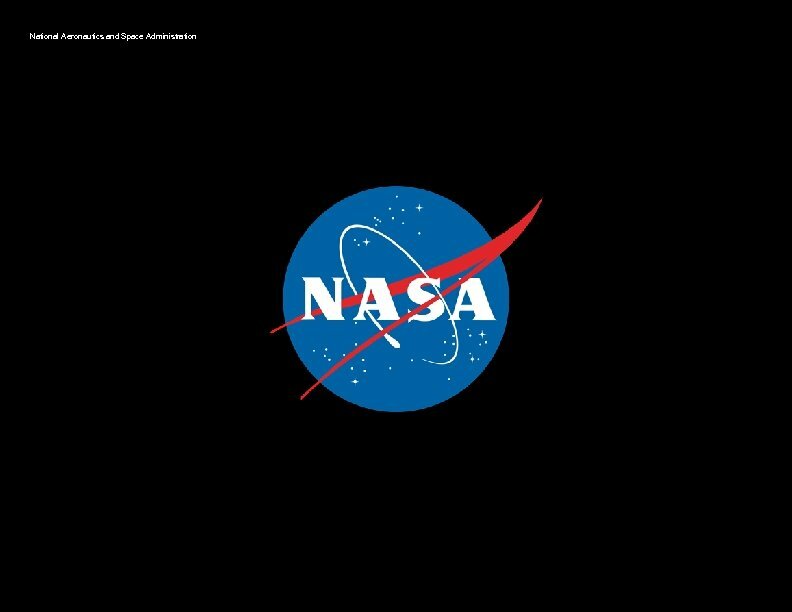 Background & Evidence • Cardiac arrhythmias have been observed during space flight, though it is not clear whether space flight itself is the cause. • Decreases in cardiovascular size and function may reduce the ability to deliver oxygen to muscles, which decreases the ability to perform physically demanding tasks. • Soon after launch, body fluid including blood moves from the legs to the head and upper body. As a natural reaction to this, the total amount of blood in the body is decreased. When the astronaut returns from zero gravity to gravity or perhaps even partial gravity the decreased amount of blood in the body, (similar to dehydration) may contribute to temporarily low blood pressure. • If the blood pressure is low enough, some astronauts may faint after space flights when their blood pressure falls due to a small, relatively empty heart. 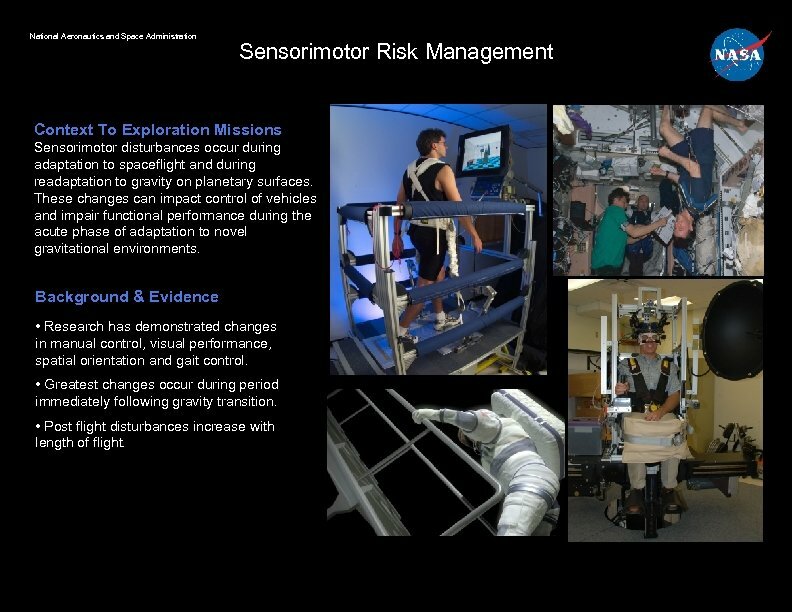 National Aeronautics and Space Administration Sensorimotor Risk Management Context To Exploration Missions Sensorimotor disturbances occur during adaptation to spaceflight and during readaptation to gravity on planetary surfaces. These changes can impact control of vehicles and impair functional performance during the acute phase of adaptation to novel gravitational environments. Background & Evidence • Research has demonstrated changes in manual control, visual performance, spatial orientation and gait control. • Greatest changes occur during period immediately following gravity transition. • Post flight disturbances increase with length of flight. 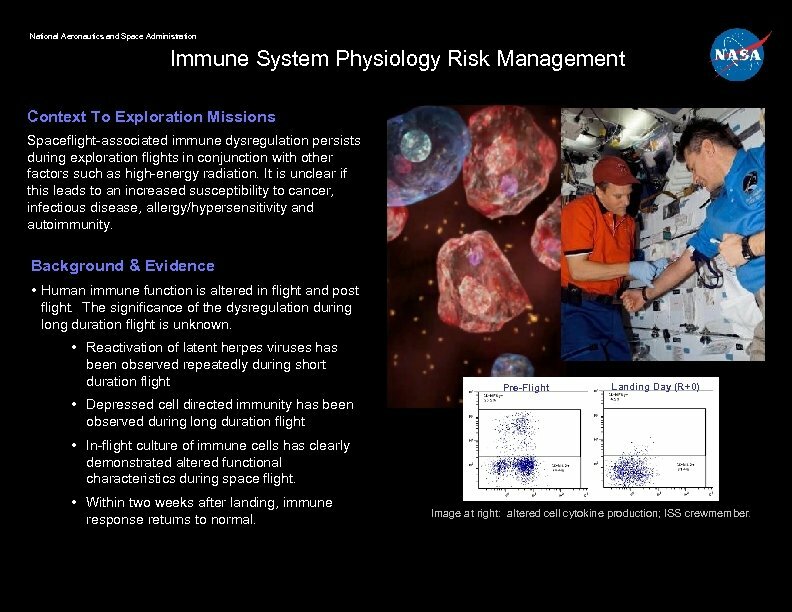 National Aeronautics and Space Administration Immune System Physiology Risk Management Context To Exploration Missions Spaceflight-associated immune dysregulation persists during exploration flights in conjunction with other factors such as high-energy radiation. It is unclear if this leads to an increased susceptibility to cancer, infectious disease, allergy/hypersensitivity and autoimmunity. Background & Evidence • Human immune function is altered in flight and post flight. The significance of the dysregulation during long duration flight is unknown. • Reactivation of latent herpes viruses has been observed repeatedly during short duration flight Pre-Flight Landing Day (R+0) • Depressed cell directed immunity has been observed during long duration flight • In-flight culture of immune cells has clearly demonstrated altered functional characteristics during space flight. • Within two weeks after landing, immune response returns to normal. Image at right: altered cell cytokine production; ISS crewmember. 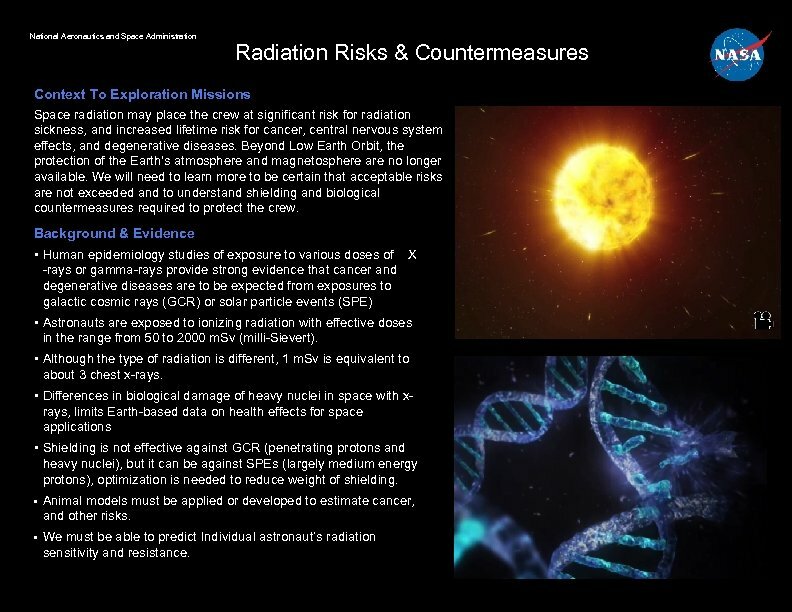 National Aeronautics and Space Administration Radiation Risks & Countermeasures Context To Exploration Missions Space radiation may place the crew at significant risk for radiation sickness, and increased lifetime risk for cancer, central nervous system effects, and degenerative diseases. Beyond Low Earth Orbit, the protection of the Earth's atmosphere and magnetosphere are no longer available. We will need to learn more to be certain that acceptable risks are not exceeded and to understand shielding and biological countermeasures required to protect the crew. Background & Evidence • Human epidemiology studies of exposure to various doses of X -rays or gamma-rays provide strong evidence that cancer and degenerative diseases are to be expected from exposures to galactic cosmic rays (GCR) or solar particle events (SPE) • Astronauts are exposed to ionizing radiation with effective doses in the range from 50 to 2000 m. Sv (milli-Sievert). • Although the type of radiation is different, 1 m. Sv is equivalent to about 3 chest x-rays. • Differences in biological damage of heavy nuclei in space with xrays, limits Earth-based data on health effects for space applications • Shielding is not effective against GCR (penetrating protons and heavy nuclei), but it can be against SPEs (largely medium energy protons), optimization is needed to reduce weight of shielding. • Animal models must be applied or developed to estimate cancer, and other risks. 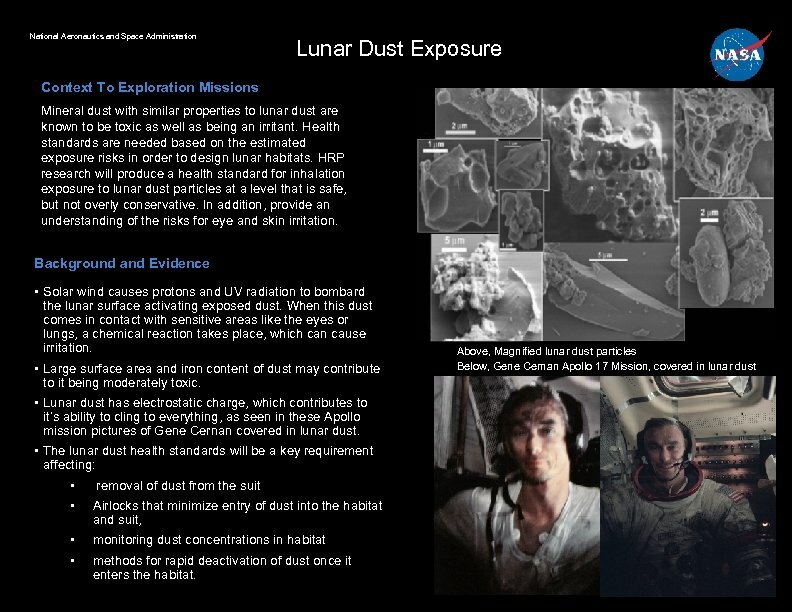 • We must be able to predict Individual astronaut’s radiation sensitivity and resistance. 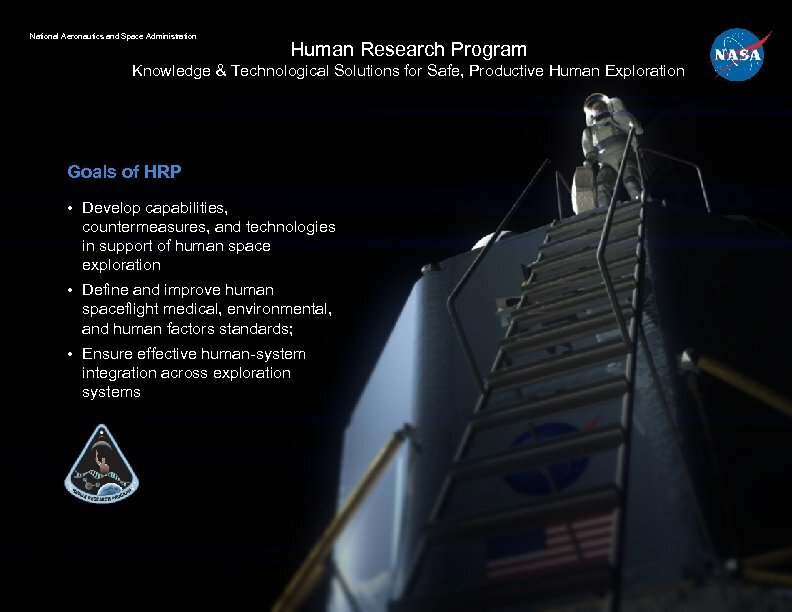 National Aeronautics and Space Administration EVA Suit Risk Management Context to Exploration Missions to the Moon may include up to 24 hours of EVA per astronaut per week. 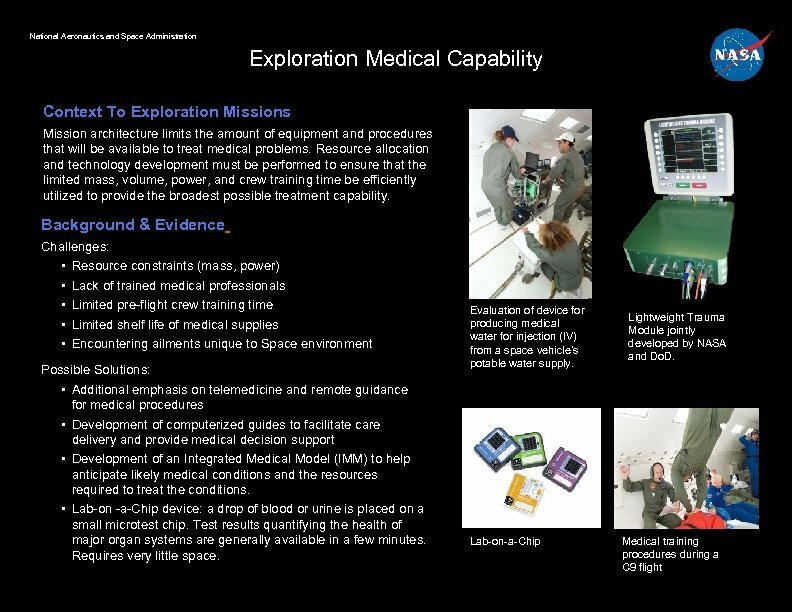 Mission success depends on designing EVA systems and protocols that maximize human performance and efficiency while minimizing health and safety risks for crewmembers. 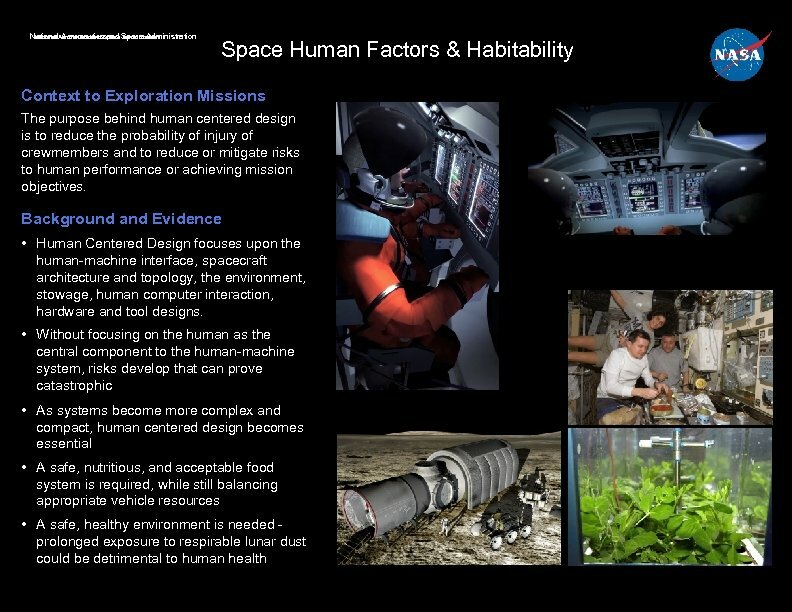 Background and Evidence • Design variables: suit pressure, suit weight, location of suit center of gravity, joint ranges of motion, and biomedical monitoring • The implications of mission architecture on crew health and safety, productivity, and efficiency are potentially enormous. 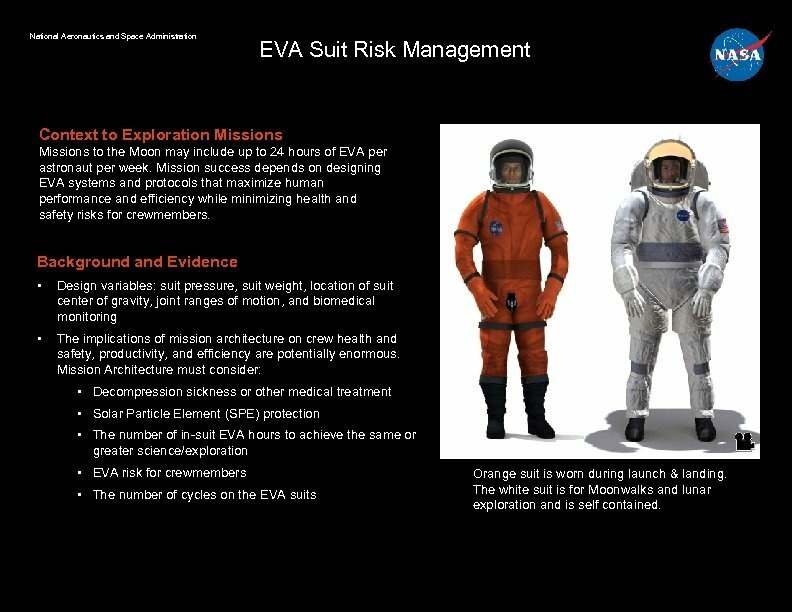 Mission Architecture must consider: • Decompression sickness or other medical treatment • Solar Particle Element (SPE) protection • The number of in-suit EVA hours to achieve the same or greater science/exploration • EVA risk for crewmembers • The number of cycles on the EVA suits Orange suit is worn during launch & landing. 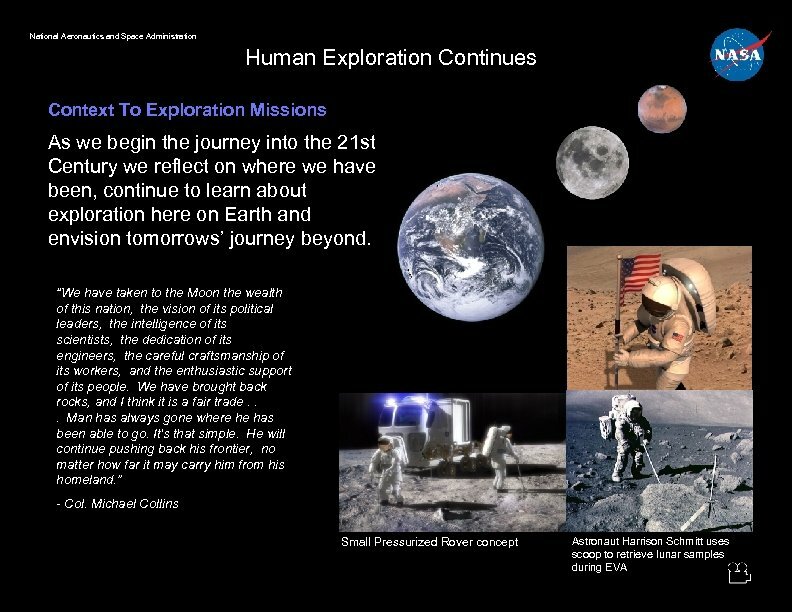 The white suit is for Moonwalks and lunar exploration and is self contained.